Retirement villages: grandma’s ghetto or country club? Numerous retirement villages, lifestyle estates, old age homes, nursing homes, frail care centres are listed in our directory. Complete the form listed below, specify the type of accommodation you are looking for and retirement facilities in your area will contact you directly. If, however, you prefer to do the searching yourself, go to the Senior Service website and search our large directory. We want you to make the right informed decisions at this crucial time in your life. Bob and Anne Sears look out at the walled garden from their two-bedroom cottage in a “retirement village” near Maidstone in Kent, and say: “We’ve never regretted moving here.” Three years ago they sold their five-bedroom house in Essex and became the first people to move to Mote House, then still under construction by Audley, one of the biggest developers of retirement villages. Surrounded by 450 acres of parkland, a number of two- and three-bedroom homes have sprung up near Mote House, which dates back to George III and is now being converted into a country club for the elderly. “We brought our furniture with us. To move somewhere and not be able to take our furniture would have been upsetting,” says Anne. “If you need care, it’s cheaper than being in a care home. Here you have all the carers,” she adds. Anne is 68 and Bob is 84; with the age difference in mind, they feel she will be “looked after” in the village in years to come. Butlins for the elderly or gated ghettos? Retirement villages are common in the US, New Zealand, Australia and South Africa, and are starting to spring up around the UK as baby boomers move towards retirement. People over the age of 65 now outnumber those of school age in the UK, and soon a quarter of the population will be over retirement age. The average retirement now lasts almost a quarter of a century, according to a 2010 report by estate agent Knight Frank. In a typical retirement village, houses are grouped around country-club-style facilities at a mansion house, with doctors and nurses on call and a night porter. Facilities at the upmarket end usually include a restaurant, gym, swimming pool, library, hairdresser, fitness classes and lectures. The first-ever retirement community was Sun City in Arizona, built in 1960 and now home to 42,000 people. Some villages come with care homes attached, but not those built by Audley. Nick Sanderson, the company’s chief executive, who also chairs industry body the Association of Retirement Village Operators UK, even believes that care homes can be avoided altogether. 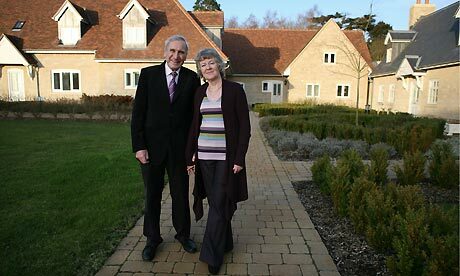 In retirement villages, residents buy their own home and retain their independence, unlike in a retirement home. People living in these villages are less than half as likely to move to an institutional care home after five years of residence than those in standard housing, according to a study by the International Longevity Centre carried out in partnership with Audley, the Extra Care Charitable Trust and sheltered housing managers Retirement Security. They are also less likely to fall – and falls are the leading cause of death through injury for those over 75. The average care home costs £26,200 a year while the average nursing home costs just over £36,000, according to healthcare information firm Laing & Buisson. Audley’s properties sell for between £250,000 and £500,000, and residents also pay an average annual management fee of £6,000. The minimum age for residents is usually 55, although people tend to be closer to 75 when they move in. Drinking tea from a mug that says “I’m not retiring – I’m moving to Mote House”, Sanderson, who plans to settle in a retirement village himself eventually, rejects the notion of “gated ghettos”. “It’s completely not that. It’s not a closed door.” He stresses that friends and family visit at weekends – but there is no escaping the fact that elderly residents will be left to themselves for much of the time, and that the villages are often a drive away from the nearest town. Property prices at London’s first luxury retirement village, near Battersea Park, will range from £400,000 to £2.5m for penthouse apartments. Despite the hefty price tags, Davies generally believes that retirement villages are “not a lifestyle choice but need-driven”. Living in a block of “retirement flats” is cheaper: homes in developer McCarthy & Stone’s blocks near Liverpool, for example, cost from £129,950. There are also more affordable villages – ExtraCare offers properties for rent, part-purchase and purchase across the Midlands and the north. However, rather than providing a stress-free retirement, some controversial operators such asPeverel, which looks after 65,000 retirement homes, mainly in McCarthy & Stone developments, and used to be part of Vincent Tchenguiz’s empire, have come under attack over excessive fees and poor service – allegations it disputes. Unlike the care home sector, retirement villages are not regulated.